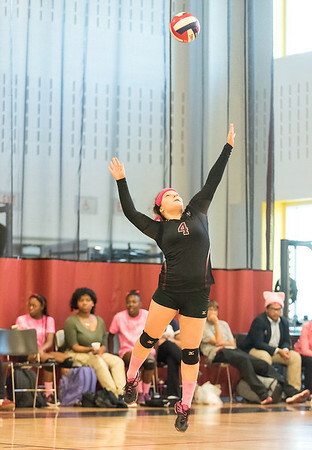 NEW BRITAIN - The Innovation girls volleyball appears to have found its groove. The Ravens swept MLC 3-0 Wednesday evening for their seven consecutive win. Innovation took the match in set scores of 25-19, 25-18 and 25-17. Molly Corcoran lead the team with 19 assists, while Aaliyah Walker had seven kills and Danelys Baez-Arroyo had six aces. Innovation now moves to 8-2 on the season and will host Capital Prep Friday evening at 5:30 p.m. Prince Tech 3, Goodwin Tech 2: It was a back-and-forth battle, but unfortunately for the Gladiators they came up just short. Prince Tech took the first, third and fifth sets 25-15, 25-18 and 17-15. The Gladiators took the second and fourth games 25-16 and 28-26. Adaneysi Guzman led Goodwin tech with 16 service points, nine aces and 38 digs; while teammate Joarielys Pino had 15 digs, 14 points and 3 aces. The Gladiators will next travel to Cheney Tech. Berlin 1, RHAM 0: The Redcoats only needed one. On a pass from Gabe Negrao, freshman Adam Kozubal found the back of the net for the lone goal of the game. Berlin goalkeeper John Addamo made three saves on the evening while the Sachems’ Marcus Emanuel had four. Berlin is now 2-5-1 on the season and will travel to Bristol Central on Friday. Posted in New Britain Herald, Berlin, Goodwin Tech, Innovation on Wednesday, 3 October 2018 21:05. Updated: Wednesday, 3 October 2018 21:13.